These awards from 2015 have been superseded by the 2018 Americas Analyst Firm Awards. Users of analyst insight in the Americas said that Gartner, Forrester Research, HfS Research and IDC were the firms that delivered the most value in 2015. HfS’ move up to third place will surprise many readers. It shows that, despite IDC’s stronger research, HfS’s ability to deliver strong peer networking and events is solidifying its audience in the Americas. Even so, the gap is huge between those two firms and industry leaders Gartner and Forrester Research. To celebrate the value that analyst firms have given to professionals in North and South America, Influencer Relations’ 2016 Americas Analyst Firm Awards honor the analyst firms delivering the highest value to participants in the 2015 Analyst Value Survey. The survey collected hundreds of responses from the Americas. 39% of the respondents work for high-technology or telecom solution providers, 44% are in major enterprises and 17% are in mid-size or small businesses. Gartner is known for its huge influence on purchasing as well as an unequaled events business. Forrester Research benefits from Gartner’s weaknesses. Clients rate its peer communities most highly, and its reprints business is clearly a threat to Gartner. HfS Research pipped IDC into third place, despite having a more uneven portfolio of services and a far smaller client base. Even so, the firm’s exceptionally wide freemium base means that it is delivering highly valuable services to a wide number of users. IDC‘s base of paying customers means it doesn’t have to panic. Users in the Americas rate its research even more highly than Forrester’s, and its reprints business extends its audience. Digital Clarity Group rounds out the top five. DCG’s is highly rated for its advisory services and influence on purchasing. NelsonHall is rated highly for research and, even more so, for its inquiry calls. It is held back by its limited ability to deliver business leads. ISG, unlike NelsonHall, is very highly rated for business leads. The firm offers strong advisory and inquiry services, but is held back by weak peer networking. Its purchase of Saugatuck might help. Everest Group is once more highly rated for research and for reprint rights, but is held back by its lack of a major investment in events. KPMG, which acquired sourcing advisors EquaTerra, is a new entrant in the top ten. That reflects the broader range of services being used to consume analyst insight. Despite lacking a serious research program, KPMG seems to be effectively competing in the market for analyst-level advisory services and purchasing guidance. CEB, which includes TowerGroup, has a unique business model. Its peer communities are its most highly valued service, but its seems to have little impact on purchasing. 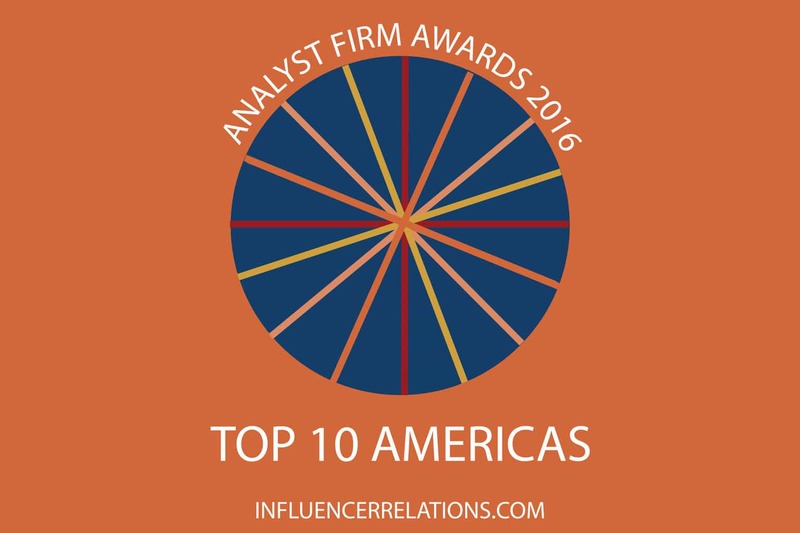 These ten firms delivered four-fifths of all the value that analyst firms delivered to users in the Americas during 2015. Indeed, 31% of the total was held by Gartner. While that confirms Gartner’s leadership, it also dispells the myth that Gartner alone holds most of the analyst community’s influence on purchasing. That influence is certainly concentrated, but it is by not means the only game in town. To find out more about the Analyst Value Survey please visit analystvaluesurvey.com. This entry was posted in 1. Identify & Evaluate, 6. Features, Analyst Firm Awards. Bookmark the permalink. Really excited to be named #5 and surrounded by such great company. Thanks for this. I realised that the 2014 awards were read mostly in 2015, since we do them at the end of the year, and then a few people were asking for the current awards. So, this year’s AVS is the 2015/16 survey and the awards are the 2016 awards. The IIAR Analyst of the Year 2015, IIAR Global Analyst Firm of the Year 2015 and Independent Analyst Firm of the Year 2015 have been announced! The Analyst Value Survey shows the responses of around a thousand users of analyst services, and the awards present the averages of the valid responses. In that respect, the list is highly meaningful. The survey don’t claim to show the accuracy of analyst firms’ predictions. It shows which firms are valued by their users. According to those responses, you seem to be mistaken in your assertion about HfS. While HfS does write about outsourcing, it is used by around two out of every five repondants who did not pick outsourcing as one of the topics they are focussed on. HfS isn’t a client.